Carrots are mostly used as food. They can be consumed raw or in the form of juices and various sweet and salty dishes. Over 35 million tons of carrots are produced each year. China is the biggest manufacturer of carrots in the world. Carrots are used in traditional medicine to reduce flatulence, eliminate intestinal parasites and to treat tonsillitis and constipation. Falcarindiol is a compound responsible for the bitter taste of carrots. This substance shows antifungal properties (can be used against fungal diseases). Carrot is biennial plant which means that it lives two years. Edible part of carrot is the root. It reaches maturity 70 to 100 days after planting. Carrots bloom from June to August. Inflorescence, called umbel, consists of miniature white flowers. Umbels become concave and look like bird's nests when they are mature and ready to release seed. Carrot has green, feathery leaves that are located above the ground. All varieties of carrots are divided in two major categories: eastern and western. Eastern types originate from Asia. They are yellow or purple in color and have branched root. Western types originate from Netherlands. They are orange-colored and can be found in various sizes and shapes (short, long, narrow, conical…). Color of carrot depends on variety. Carrots can be yellow, white, orange, red or purple in color. Orange color of carrots originates from pigment known as beta carotene. 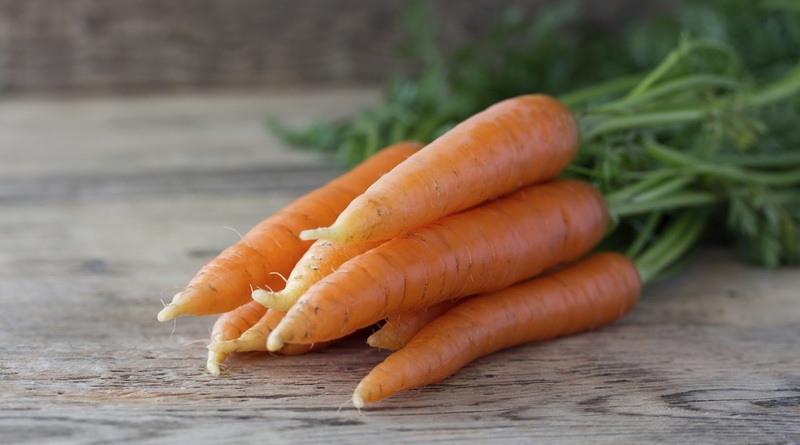 This substance was first discovered in carrots, hence the name "carotene". Beta carotene from carrots turns into vitamin A in the human body. This vitamin is essential for normal eyesight (lack of vitamin A may result in night blindness). Too many carrots in diet may lead to orange skin especially on the palms and soles. This condition is known as carotenosis. Size and shape of carrots depend on the variety. Longest ever recorded carrot had 17 feet in length, while the heaviest carrot had almost 19 pounds of weight. Baby carrots are not originally miniature in size. They are produced from slender carrots by cutting into small and equal parts. Rabbits love to eat carrots, but they shouldn’t eat too many. A rabbit eating a single carrot is like us eating over 20. Carrots are good for rabbit teeth and don’t have artificial sugar, but even too many natural sugars can cause digestive problems and diabetes. Unlike other vegetables, carrots are rich in sugar. They also have high level of fibers, vitamin A, E, C and vitamins of the B group. Carrots also posses numerous valuable minerals.